FHWA Public Roads article that describes how the NWZAW campaign took root, what strategies have proven effective at improving safety, and what work remains to be done. 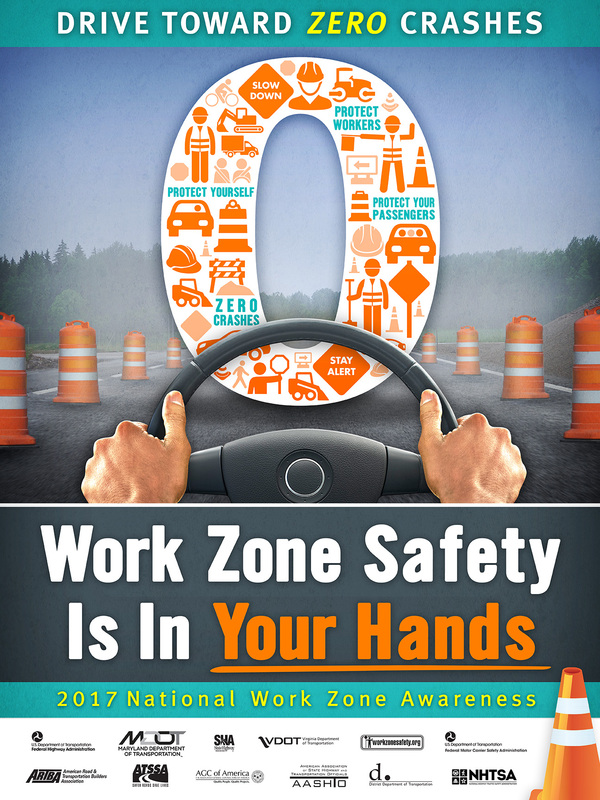 Each year in the spring, National Work Zone Awareness Week (NWZAW) is held to bring national attention to motorist and worker safety and mobility issues in work zones. Since 1999, FHWA has worked with the American Association of State Highway and Transportation Officials (AASHTO) and the American Traffic Safety Services Association (ATSSA) to coordinate and sponsor the event. The first national event was held at a work zone in Springfield, VA in April 2000. Over the years, other transportation partners have joined the effort to support NWZAW. In addition to a national event conducted each year, many States host their own NWZAW events. 2019 National Work Zone Awareness Week, April 8-12 – "Drive Like You Work Here"
The 2019 National Work Zone Awareness Week will be held April 8-12. The national kick-off press event will be held on April 9, 2019 at the Frederick Douglas Memorial Bridge (South Capitol) project https://www.newfrederickdouglassbridge.com/. 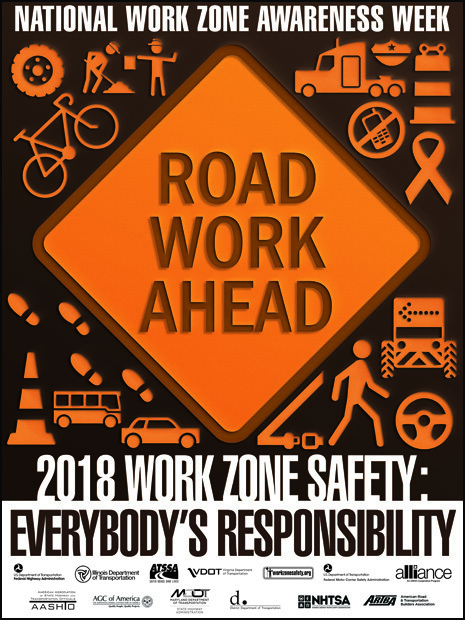 2018 National Work Zone Awareness Week, April 9-13 – "Work Zone Safety: Everybody's Responsibility"
2017 National Work Zone Awareness Week, April 3-7 – "Work Zone Safety is in Your Hands"
2016 National Work Zone Awareness Week, April 11-15 – "Don’t Be That Driver"
2015 National Work Zone Awareness Week, March 23-27 – "Expect the Unexpected"
AASHTO’s "Expect the Unexpected: National Work Zone Awareness Week 2015 PSA"
15th National Work Zone Awareness Week, April 7-11, 2014 – "Work Zone Speeding: A Costly Mistake"
14th National Work Zone Awareness Week, April 15-19, 2013 – "Work Zone Safety: We're All In This Together"
13th National Work Zone Awareness Week, April 23-27, 2012 – "Don't Barrel Through Work Zones! Drive Smart to Arrive Alive"
12th National Work Zone Awareness Week, April 4-8, 2011 – "Safer Driving. Safer work zones. For everyone." 11th National Work Zone Awareness Week, April 19-23, 2010 – "Work Zones Need Your Undivided Attention"
Go Orange Campaigns - An increasing number of states are lighting public buildings in orange and encouraging citizens to wear orange to show support for NWZAW. 10th National Work Zone Awareness Week, April 6-10, 2009 – "Drive to Survive - Our Future is Riding On It!" 9th National Work Zone Awareness Week, April 7-11, 2008 – "Slow for the Cone Zone"
8th National Work Zone Awareness Week, April 2-6, 2007 – "Signs of Change"
7th National Work Zone Awareness Week, April 3-9, 2006 – "Working at the Speed of Night"
6th National Work Zone Awareness Week, April 3-9, 2005 – "Slow Down or Pay Up"